Suddenly the animal stops. It is aware of my presence. 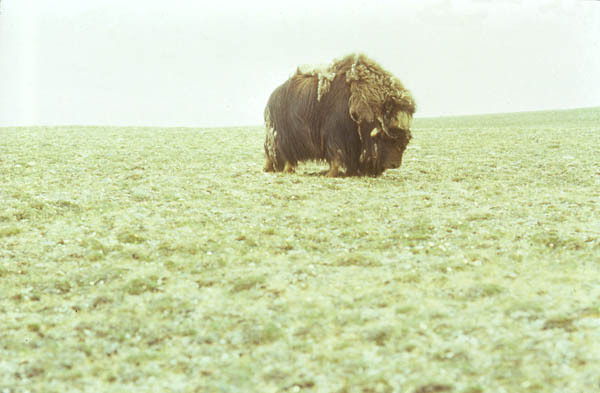 The Muskox paws the ground and rubs his nose across his leg. I am told that this is a danger signal - the animal may charge. Did I say I had the "best seat in the house?" An inner voice asks, 'What are you going to do now, Dommasch?' Luckily, I did not have to figure out an answer. Slowly I stand up to try and make a graceful retreat. As I rise the Muskox and his mate high-tail it to the next hill to see what further action I might take.